Hi, I’m writing a software renderer for learning purposes, and I chose SDL to display the rendered frames. 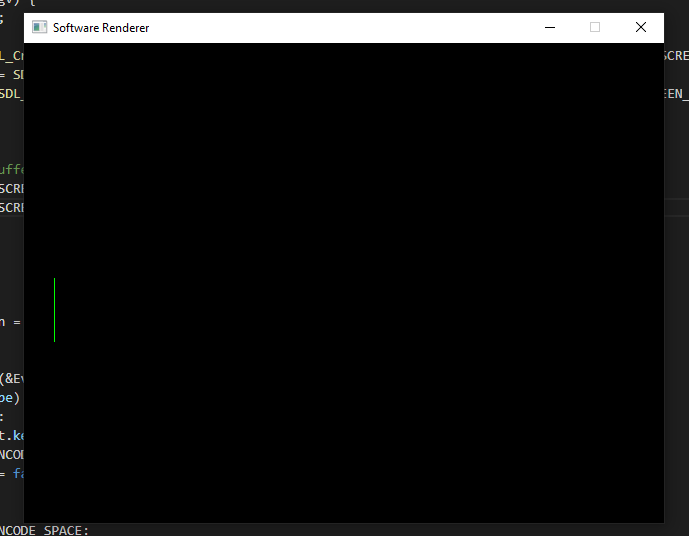 To do it, I have a SDL_Renderer to which I render a fullscreen SDL_Texture containing the frame pixel data. This is the frame correctly rendered (Just one green line), if I press space it should draw a different blue one, but it doesn’t. I tested this on my system (Mac running MacOS 10.14.4) with SDL 2.0.9 and it worked fine. Pressing space switches between the green and blue line. Not very helpful but it seems the problem is probably not your code. As an aside, if you’re going to use a streaming texture, use SDL_LockTexture() and SDL_UnlockTexture() instead of SDL_UpdateTexture(). It’s faster, and won’t require you to keep your own memory buffer around. Thanks a lot for you time, I’ll try to test it in another system as well. Also, thanks for the advice on the texture stuff.